The mother of all swiping apps, Tinder is one of the most popular dating platforms allowing members to sift through millions of potential matches. Simply swipe right to show interest and left to pass on a potential date. As soon as 2 members both swipe right, you’ll match and have the option to chat. Although the high number of active users is an advantage, it also means you’ll have more users to filter through. The signup process is remarkably easy. All you need is a Facebook account, and you won’t need to worry about anything appearing on your page connected to Tinder. The app will take all your basic information from Facebook, including age, location and profile picture. Once you’re registered you can go ahead and pick a main profile picture of your choice and 5 additional photos. In the profile section the app gives you the option to write a short bio. Describe yourself in a few words (up to 500 characters), then select your place of work, and/or school, and if you want, you can connect Instagram to display your Instagram posts on your Tinder profile. Once you’ve signed into the app, it won’t ask have you login each time you visit, as long as you stay signed into Facebook. If you’d like to sign out, you can logout of your account from the account settings screen. What makes Tinder so tantalising is the ability to swipe to your hearts delight and decide which profile tempts your fancy. Photos will pop up on your screen one by one, each photo will appear with an age and show whether you have mutual Facebook friends. If you’re interested in discovering more about a user you can tap on the photo. This function allows you to see how far away they are from you at this moment, how long ago they were active on Tinder, and an additional ‘about’ section where users can write a little bit more about themselves. If you’re interested, swipe right for yes (the heart), and if they don’t make the cut, swipe left for no (the X). If you both swipe yes immediately it’s a match and you’ll receive a full-screen notification, otherwise you’ll receive a banner notification at a later time. You either make the first move and choose to message, or play hard to get and continue swiping. There’s no real scientific algorithm behind the matching, instead the app uses location-specific data to suggest Tinder users who meet your location preferences. Tinder has a bunch of additional features to help make the app more engaging and add value for members. Not long ago, it rolled out the new ‘super-like’ feature. The free feature allows users to swipe upwards or ‘star’ people to whom they are especially attracted. This is pretty much as close as you’ll get to declaring love in the virtual dating world. Use this feature wisely as members can only ‘super-like’ once every 24 hours. The ‘super-like’ works to add some value to each match, especially since some users just swipe right on every profile on offer. 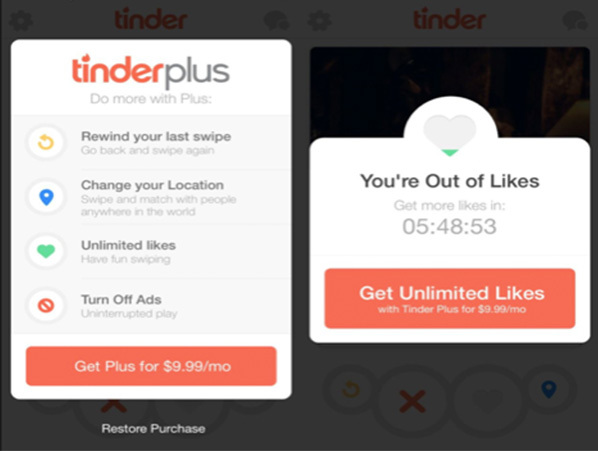 To really help boost your Tinder experience you can pay to subscribe to TinderPlus—a premium service allowing users to subscribe to new features including the ability to rewind swipes, change locations and get unlimited likes. The rewind swipe is a smart feature where in case you mistakenly liked somebody, you can then go back and correct your mistake. The Tinder Passport is a revolutionary feature that allows you to virtually travel to a dream destination, or at least one you’re planning on travelling to next week. Imagine you’re doing a year abroad in Australia and want to meet people ahead of time, just adjust your location and get chatting. You’ll also still be able to navigate between your current location and new destinations—you can keep up to 4 passport locations in your list. 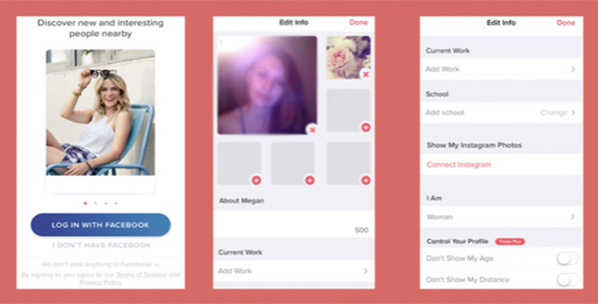 The paid subscription TinderPlus will also grant you unlimited (right swipe) likes. Usually, you get around 110 right swipes per 12-24 hour period. Unlimited right swipes means you won’t have to worry about counting swipes but you’ll probably be a little less picky and get more matches because of it. Just remember if you live in a less built up area there might be a limited number of profiles and potentially run out of swipes faster. Another fun feature to TinderPlus is you’ll get a total of 5 I-really-really-dig-you ‘superlikes’ instead of just the one. When someone you Super Like is looking at your photo they will see a blue bar, a star and a message that you Super Liked them. TinderSocial is a platform from which you can meet potential partners, but in a group setting for those that don’t particularly enjoy the sometimes awkward one-on-one dating situations. The way TinderSocial works is it will prompt you to chose Facebook friends who are also on Tinder to join your group, and then will offer up other groups to match with, just like it does on regular Tinder profiles. Scroll through the profiles of people looking to hang out with fellow groups, and once matched up, you can make plans through the chat feature. Really want to give yourself a boost? TinderBoost pushes your profile to the top of your potential matches swiping queue for 30 minutes. It’s the digital form of ‘getting yourself out there’ as many more users and potential matches will see your profile. You can purchase a TinderBoost at anytime and you automatically get 1 free per month when you sign up for TinderPlus. The best thing about TinderBoost is that nobody will know you’ve been giving yourself a helping hand. The company states that it takes every security measures to help safeguard its members personal information from unauthorized access and disclosure. However, there will always be the same potential risk that you might take from any digital dating platform out there. The best way to protect yourself, (which you should always do before meeting a stranger) is to use your common sense. If you’ve matched with someone, always try and do a basic background check before you meet up. The advantage of members linked to a Facebook profile, is the ability to play detective and see what information you can pick up. Never reveal too much information about yourself before you meet, such as your home address or social security number. There are a lot of scammers out there fishing around for information so always be on your toes and keep a lookout for fake profiles. Tinder has a great FAQ section with pretty much every possible question imaginable. It explains all the features and how to use them and if you have a request or suggestion not listed there’s a pretty simple contact form you can use. Yes, Tinder has a reputation as a hook-up site—but that’s not to say it’s not still a great way to meet people, especially users in your location. Great value as you still get a lot without using the paid subscription. Super easy to use and you always hear of those love stories that began with a one-night Tinder stand.